Y’all the Chipotle of Italian food has arrived and I’m in love. Guest writer @christenmmariee worked some magic and got us into the pre-showing at Piada Italian Street Food and it was divine. Piada is the latest addition to the Memorial Drive strip right by Memorial Park. Walking in, you might be confused because the decor looks remarkably like a Chipotle-clean wood lines, modern white lights, a wrap around line to the windowed counter….Clearly all these fast casual restaurants that are popping up everywhere *cough* eT Craft Burgers & Beer *cough* have done their market research and realized that people like to watch their food be prepared and they like custom options. 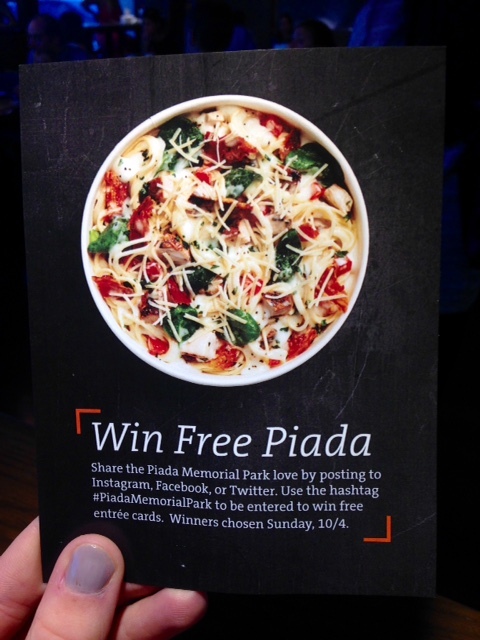 Piada’s menu is broken down into three categories: piadas (their signature wrap with thin crust dough), pastas, and salads. They also offer Tascas, light Italian sandwiches on thin crust piada dough, and seasonal sides. You can choose a meal from their preset menu suggestions from one of the three categories or you can create your own. 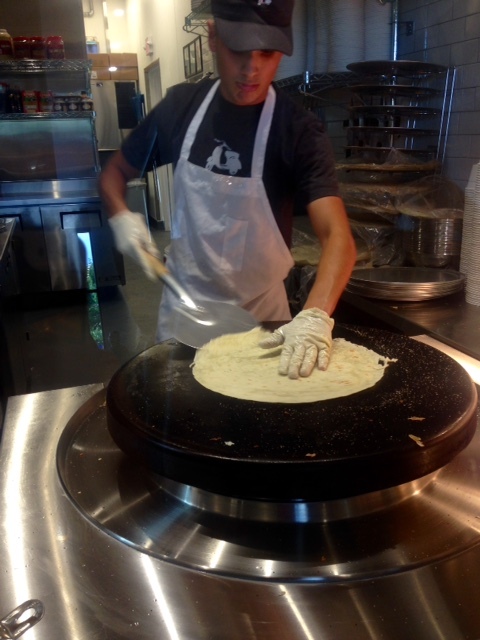 The piada dough is what makes the wraps unbelievably good. They are hand toasted in front of you and are coated with a buttery oil mix and spices. You can taste the dough’s flavors as you eat. Christen chose the Chicken Fritte Piada from the preset menu that had crispy chicken fritte, mozzarella, romaine, sweet & spicy peppers, with a spicy Tuscan dressing. I went rouge with the build your own Piada and selected roasted veggies, spicy Diavolo sauce, mozzarella, spinach, tomatoss, sun dried tomatoes, red peppers, mushrooms and….wait for it…..ANGEL HAIR PASTA. Yes, you heard me correctly. They put PASTA in my PIADA. PIADA WITH PASTA. OMG. It was better than you could have ever imagined. I could rave about this for days, but I will contain my excitement to this post. AH SO GOOD. ALL OF THESE CAPS ARE JUSTIFIED AND NECESSARY. From the seasonal sides, we also sampled the Orzo Crunch with orzo, olive oil, almonds, sugar snap peas, sweet glazed pecans, currants, red bell peppers, lemon basil dressing and the Tuscan Kale Salad with kale, carrots, heirloom tomatoes, Italian chickpeas, and parm. All of it was fresh and light and so dang tasty. Piada has a Italian Soda and Tea Bar stocked with some seriously delish sweet tea. All you Texans and southern belles out there, it’s for real and totally worth a try. We also sampled the Cannoli Chips, which are a crunchy interpretation of a traditional cannoli. It’s an italian cookie dusted with powdered sugar and comes with a chocolate chip cream icing. I don’t even like sweets and I liked this dessert. That’s saying a lot. Tags: cannoli, Chipotle, italian food, Memorial Park, pasta, Piada, Piada Italian Street Food, street food. Bookmark the permalink.